Your DesignaFriend will be eager to go jet setting anywhere in the world with the Chad Valley DesignaFriend Weekend Accessories set. 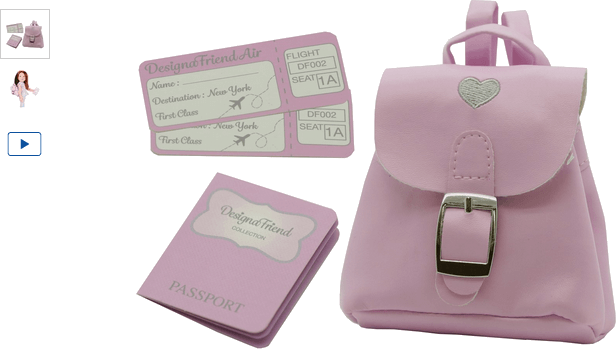 Ideal for on the fly getaways, the lovely pink leatherette rucksack is designed with an extremely pretty embroidered heart and includes a pink plastic camera with loop handle, paper passport and two plane tickets - destination wherever your imagination takes you! Get money off with April 2019 free Argos voucher codes, see if there's a promo code for the Chad Valley DesignaFriend Weekend Accessories product. Argos may be out of stock of this product. To enhance your shopping experience you may also be redirected to a search results page when you click an outbound link. 4.4/5 from 8 recent reviews.